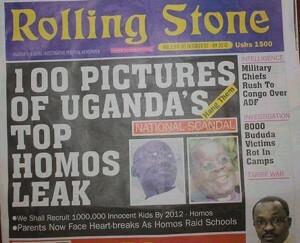 Since the newspaper ran, at least four gay Ugandans on the list have been attacked and many others have fled into hiding. The role of the newspaper reminds one of the state-owned newspaper Kangura in the Rwandan genocide. We recently saw how legislation was introduced a year ago in Uganda to execute homosexuals — legislation drafted after a visit by U.S. conservative ministers and activists. Almost two dozen homosexuals have been attacked over the last year and over a dozen have been arrested. man seeks to live among them as their equals they will either destroy him or devour him.